Eat healthier. Together. Use these tips and tricks to get your spouse (or co-worker, friend, etc.) 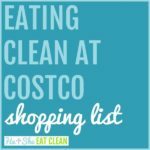 to go through this clean eating journey with you! We get this all the time: I want to start (or do) eating clean but my husband/wife, boyfriend/girlfriend, or children will not. As we mentioned in “Our Story“, Scott starting eating clean a few years before me. So, I would eat clean because that’s pretty much all we had in the house, but I did not quite understand the concept. I would eat the wrong foods at the wrong times (sugary snacks late at night). One day I just got sick and tired of being sick and tired…Scott was at the gym and seeing results, so why not go there with him and start making changes? He was always eating clean, so why not do it too? Instead of continuing to fight him I joined him. With that being said, I am a huge believer that you cannot force someone into this lifestyle. 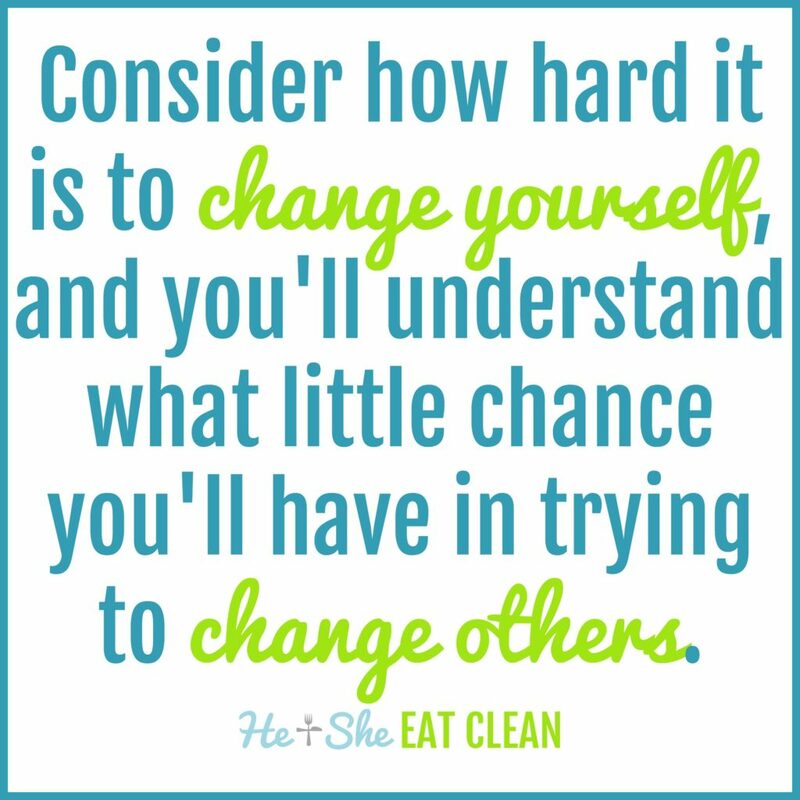 They must want to change and they usually will when they see the physical and mental changes you’re making. 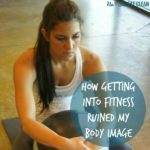 If I could talk or force everyone into this lifestyle I would because I truly believe it is the best way to live a healthy life, but I also realize that forcing your loved ones to make changes to their diet usually results in resentment. This was originally published on Jul 25, 2012, and updated Aug 15, 2018. The primary thing that you can do to help your loved ones see the light is to lead by example. I was totally that person who would tell Scott, “Come on, one isn’t going to hurt you, Stop being so picky, Do you REALLY have to pack all that food?, It is so annoying that you have to eat every 2 hours…you’re like a baby!” You’ll hear these comments too, but when you start to see the changes you’re looking for, you just brush it off and hope that person will find inspiration in what you’re doing. Attitudes and behaviors will change, it just takes time. Scott was “that man” that would only eat red meat, fried foods, no vegetables, no fish, etc. and I was “that woman” that would get so mad when Scott would try to “educate” or “guide” me in the right direction. Once that other person sees the changes you’re making…they’ll become curiously inspired and want to learn more (even though they may not tell you). Now, looking back, I wish I would have started eating clean when Scott did, but I am so glad that I am now healthy enough and have enough energy to do the activities that we enjoy doing and spending time together. I see this ALL THE TIME. Either the husband or wife is very extreme with their fitness. 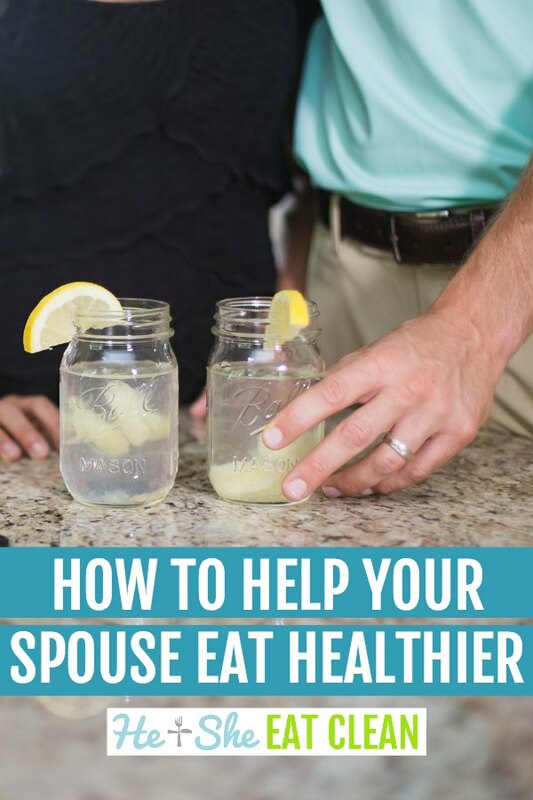 They run for hours each week, or workout all the time and the spouse seems to literally do nothing. Don’t scare off the person you are trying to help by making them think they have to invest half their week into working out! No one needs to workout that often and 30 minutes a day 3-4 days a week is perfect to start out with. If your spouse doesn’t want to join you in the gym, see if they will go for a walk with you or do a workout DVD together. If your family isn’t on board with you, the worst thing you can do is clean out the pantry or throw away their favorites foods. They will find a way to eat it behind your back! Start with small, slow changes. Take a favorite dish and try to make it healthier. Some of our family favorites are Zucchini Lasagna, Chicken Tortilla Casserole, and Savory Chicken Casserole. Or you could try a certain meal to change for a week. A good place to start is breakfast so that you are starting the day off on a healthy foot! Try our Peanut Butter Banana Breakfast Loaf, Apple Cranberry Overnight Oats, or Blueberry Crumb Cake Muffins. I do not have any kids, so I don’t really want to touch on this subject for too long but I bet that if you started cooking clean food and didn’t tell them it was “healthy” they wouldn’t know (same goes for your spouse!). 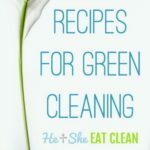 You don’t have to tell the whole family that you are going to start cooking or eating healthy, you don’t have to announce that you swapped out certain ingredients, etc. One time we actually made a cookie cake out of garbanzo beans and our niece and nephew LOVED it. They didn’t even know it wasn’t the real thing. Don’t make a big deal out of it but you can educate them on food choices (just as you would with behavior, money, learning, etc.). 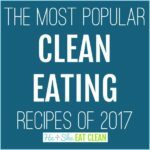 It’s unfortunate that children are exposed to junk food everywhere they go (it’s no wonder that many kids are severely obese and have diabetes), but if you’re teaching them to make the right choices and providing them with clean foods at home then little treats here and there are okay (moderation is key!). They should know the difference between a treat versus regular food. Kids love different kinds of fruit…find local, organic fruits that are in season and provide them with “nature’s candy” or you can try some of our “clean treats“. You are their parent so you control what goes into their body – do yourself and your family a favor and make sure the food they eat is helping them and not hurting them. Explain how much this means to you and that you will continue your healthy living journey with or without them. Sharing your goals and your why might help them see why you are doing this. Keep in mind that if you tend to have a “new thing” every week or yo-yo diet and they see that, they might be hesitant to join you in “yet another journey”. 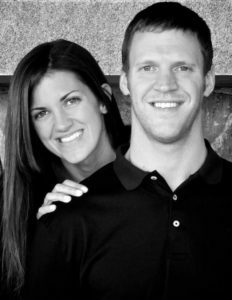 If you are serious about changing your lifestyle, and not necessarily losing 10 pounds by a certain date, let them know. Take a minute to think about it…I bet those people who are trying to convince you to buy organic foods and eat clean probably look and feel a lot better than those who have no self-control and tell you that it’s not worth the money, food’s too pleasurable, “you only live once”, and so on. So, who are you going to believe? This isn’t a complicated message. In fact, Eating Clean is as simple as it can get. So what’s the bottom line? Eat a variety of wholesome, natural foods by combining lean protein with complex carbohydrates from fruits, vegetables, and whole grains. Kick out the crap, invite in the good, throw in some water and you are on your way to excellent health and a better body than you’ve ever imagined. Is this information new? No. It’s the same information we’ve heard from our ancestors time and time again. Does your whole family eat clean? What tips could you share to help others? Leave a comment below! Already eating clean but getting flack from family or friends? Here is a great post to help you deal with “toxic” friends and family! Mine goes like this – be confident and strong in your goals and stop talking about them all the time. It is so much easier for me to NOT talk about my goals and stuff with family or my bf I live with. Instead when asked if I was [insert treat here], I just say a simple “no thank you” without explanation because reality is it’s not because I am “on a diet” or “losing weight” it’s because I am making a habit of eating healthy all the time for health’s sake! I also find this helps to encourage my partner as I find he will ask about having a snack and because I’ve said no sometimes he just forgoes it too! That’s why I love the “don’t make it a big deal” part! I like to just make small adjustments to my meals and keep most things the same, you have to be flexible in goals to help others understand that it’s not all or nothing, being healthy or working to be fit doesn’t mean no buns for burgers or no dessert it means asking if you really need it that time and moving on like it’s NBD! Starting the 4 week shred next week! Do you have a challenge for it at all or a FB group?